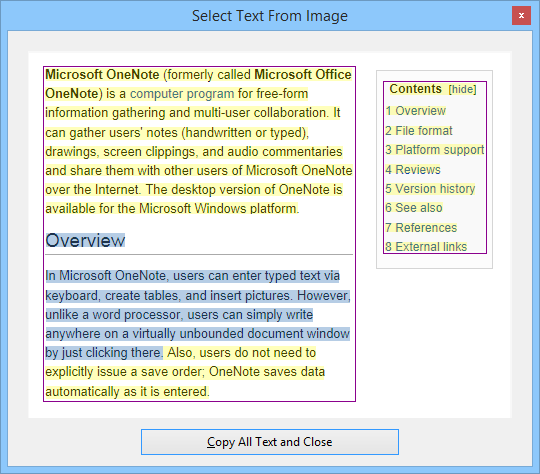 OneNote can recognize the text in images in your notes and you can even search them. It also has a little hidden feature that allows you to copy the text from an image. You can just right click on an image and choose Copy Text From Picture. This doesn't always do what you want though. You may want to just copy an address or a tracking number from a screenshot. But copying the whole text and then pasting it somewhere and then finding what you want is cumbersome. Wouldn't it be nice if you could select and copy the text from the image similar to copying from the web? An update to Onetastic which adds this new feature is now available: Select Text from Image. Let's say you have the following screenshot you captured from a web site and want to copy some text in it. 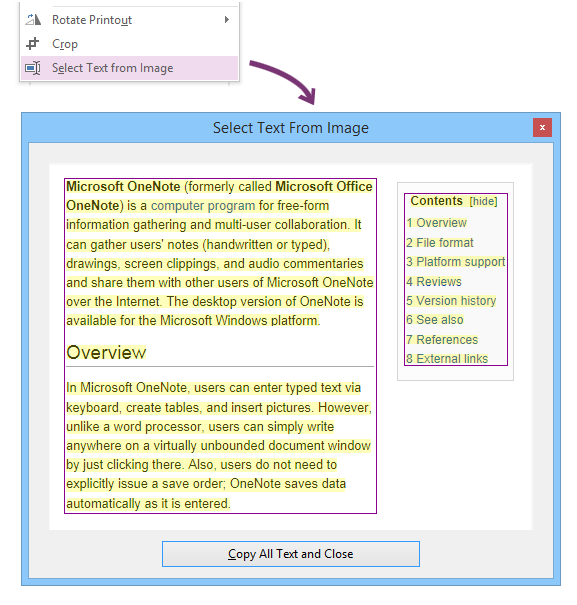 You can access the Select Text from Image feature from the right click menu along with two other Onetastic features, Rotate Printout and Crop. Note that with a single drag selection, you can select text within a single region. It was too complicated to find a way to select across regions with a single drag. However once you select some text from a region, you can then press and hold the Ctrl key and select more text from other regions. Clicking anywhere on the window will clear the selection. Also if you noticed the button below the image was reading "Copy All Text and Close" and once you make a selection it turns into "Copy Selection and Close". The button does what it says. If you didn't select anything, then it will copy all the text on the image, and if you selected some text it will copy just the selection and then close the dialog. You can also use the universal copy shortcut: Ctrl + C.
As simple as that. Hopefully this will save a bunch of time. One thing worth noting is that OCR is not a perfect technology and may not detect all the words 100% correctly. So you may end up having to fix the copied text, which is most of the time easier than re-typing the whole thing. One minor issue is also fixed with this update. Custom styles with font names containing spaces (like "Times New Roman") is now working properly. Omer, I did some extra tests and you are right, it is more complicated than I expected! In fact, I just realized that when I connect my Surface Pro to my Surface Dock, my 28" screen is at a different scaling factor (150%), which complicates things even further when I switch OneNote from my Surface screen to my large screen! Wow, what a nightmare for developers. I looked at the page XML and I believe the coordinates of the OCRed text is saved along the extracted text, right? This leads me to another idea though… How is OneNote able to properly maintain the position of ink on a page relative to an inserted image (like a PowerPoint slide inserted via Print to OneNote and annotated using ink in OneNote)? Can't you use the same technique to calculate the same relative position of extracted text with relation to the image? Thanks Omer for your reply. I know it is not a trivial task. However, I once encountered a related problem with an AutoHotkey script, and I solved it using by reading the "HKEY_CURRENT_USER, Control Panel\Desktop\WindowMetrics" registry key, dividing the read value by 96 and storing it a variable called ScreenScaling. Using that calculated value, I was able to solve almost 90%+ of the weird scaling problems. I see your point about the fact that the it can be different when using multiple computers, BUT in the case I reported, I can assure you that the problem is very real on an image inserted on my Surface Pro (200% scaling), OCRed on the same computer and text extracted on the same computer. If your dialog box could multiply the positioning and dimension of the yellow selection rectangles by ScreenScaling (as described above, i.e 2 on my Surface Pro), I believe it would solve the issue, at least when everything is happening on the same computer. Philippe: This is complicated. It depends on the DPI of the computer which inserted the image, as well as the computer which ran OCR on the image. These two can be different and they can both be different than the computer you are using to run Select Text From Image. Things should work if they are all the same. Omer, are you aware that Select Text From Image function does not work well with high DPI? On my Surface Pro (200% scaling), the yellow highlight to select the text to extract does not appear at the right place above the text. Ana: This is currently not possible. You could do something like: Right Click key ([≡]), then up arrow (↑), then Enter. You can use an external tool like AutoHotKey to do all these at once with a shortcut. I would like to put Select text from image on the fast tool menu, Can I do that. Ideally, I would want to call it with a keyhot. I just sent you an email about a Outlook Date Macro extension to handle scanned and printed documents and this functionality would be great for those cases where a date cannot be recognized. Is there a way to higlight the selected text in image itself?? Many thanks for sharing the add-in. Will it be possible to write a macro that OCR\'s all the images to a selected language, and copies all the text from all the images to clipboard or notepad. You have created \"Select Text From Image\". If you can make \"Select Text From All Images\" and display the same, it would be very useful. Oh, I see. Thanks for that. 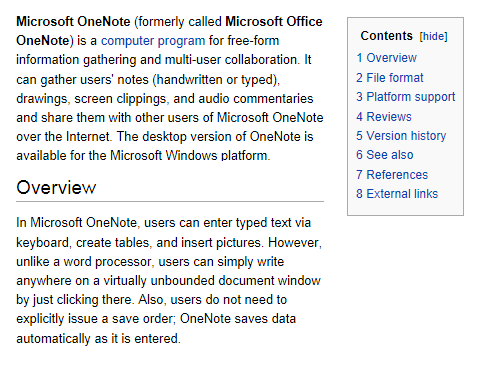 Looks like an \"undocumented feature\" in OneNote. I just tried it too and I see that it also depends on the DPI setting on the computer. On my laptop where I have 150% DPI, OneNote treated them as part of same text, whereas on my desktop with 100% DPI it found two separate regions. The details are not documented and can also change from version to version, therefore I don\'t think you can get any information about it. Oh! All I did was copy your example image above, assuming that I should be able to get the same results (and regions) out of OneNote as you had done. Where could one go to to find out more about OneNote\'s criteria for identifying these \"regions\"? Slartibartfast, that depends on the image and how OneNote actually recognized the text. If it didn\'t recognize different regions, then you won\'t get them. I should add that the \"regions\" mentioned in your post do not occur in the Select Text From Image window - this is in OneNote 2013. I updated OneTastic to Current version: 2.4.1 - Jul 21, 2013, and then enabled it (I had previously disabled it, as explained in my separate email to you), and then I tried this feature out. * Copy Text From Picture (copies all the OCRed text to the Clipboard). * Alt Text (brings up a window where you can select OCRed text and copy it to the Clipboard). But what had been missing was the ability to operate on the text actually in the image (which is ergonomically and intuitively an ideal approach). Now you have enabled this. Thankyou. Nice piece of work. 2 on Office other file and PDF support enough perfect, we for information of sources not only is through page, for other Office file and PDF is is important of, if can in OneNote in the import export, and view, and edit these file on too Rod has, such as OneNote for table of edit capacity worst, if can directly import or insert xlsx file and in OneNote in the directly for edit or view on too good has, Seem to OneNote2013 will improve this and look forward to! 4 is just mentioned, synchronization for multiple platforms, in addition to the PC port, and editing capabilities for other platforms should also be enhanced! It is impossible for us to sit in front of the computer, hunchback abandoned pen and paper, the only 24-hour is around in smart phones such as Android or Apple, as a \"one note\" not enhanced multi-platform sync, enhanced editing functionality in the Smartphone version, want you to use? 5 plugins and templates can provide richer, Evernote\'s treasure chest is worthwhile! Sincerely hope that OneNote will get better!!!! I need this for crop alone. Amazing Microsoft did not include this with OneNote. GREAT tool. Thank you for this tool. Great features that I needed: crop, select text from image. hanker, this is a known issue if you close OneCalendar when it is minimized. To fix it, close OneCalendar, then go to C:\\Users\\<username>\\AppData\\Roaming and delete onecal.xml file. Then it should start normally. Sorry for the trouble, I will fix it with the next update. problem:when i installed this at may 25,the onecal worked well.but after i cleaned the regeister , the onecal didnot work at may 27.it appeared just in the sidebar , not stayed upon the windows. juan inÃ©s, follow steps at <omeratay.com/onetastic/?r=faq#uninstall> to uninstall Onetastic. After that you can close OneNote and reinstall from the installer. Estaba muy contento con ONETASTIC, pero no sÃ© porquÃ© motivo me dejÃ³ de funcionar. He mirado para desinstalarlo y volverlo a instalar pero no hay opciÃ³n para desinstalarlo. Ya he ido a componentes activar pero me da error de carga. At times, the text in the image is tiny. This happens a lot when the image is created by the (full page) print to onenote feature. It is nearly impossible to select text. A zoom function would be nice. I JUST FOUND THIS!! THIS IS BEAST!!! (as my 15 year old would say). I have been looking for this type of utility since I bought 2010. Where have you been all of my life? I would happily pay for these features. Thank you, Thank you, Thank you!! Of COURSE I should be able to select just some text from the image! I was shocked that Microsoft didn\'t make this easy to do from the start. I travel constantly and live on my laptop, and the ability to treat ON as a printer is fantastic for capturing receipts, confirmations and boarding passes from corporate web sites. It works so well that I intuitively expect it to be real usable data there on the screen, not just a picture of some data. seems obvious that I should be able to select the address in the image and drop it into Google Maps, or grab the confirmation number from a boarding pass and paste it into the web form. Thanks for bringing your abilities to bear on the problem. I don\'t envy you the frustration and tedium that must lie between knowing how to grab image text from ON and packaging it up as a distributable feature for non-technical people. I am very grateful that you\'ve made it available to me. Thanks. I\'ll use this many times a week. Kathy Jacobs pointed me to Onetastic. What an extraordinarily useful piece of invention! Wow! For various reasons in my case -- i.e., the need to shuffle together multiple PDFs to create an entirely new rewritten and reformatted final document -- Onetastic makes the difference between OneNote \"working\" for what I do (with all many benefits and advantages of OneNote) -- or not. \"Select Text from Image\" is a nice feature.